Sorry, I’m a complete noob at creating games in general but I hope to get better in the future. I’m making an RPG in GDevelop 5 but I’m not sure how to advance conversations. To move to the next dialogue, I set it so you have to press A, but I found that this skips all the way to the last dialogue box. I tried setting variables (Do + 1 to variable Conversation of Text) but it also has the same problem. I could use a timer but I’m not sure how to use that effectively. I found a question similar to this (Help with Dialogue) but the answer has a link which leads me to a 404. I set it so you have to press A, but I found that this skips all the way to the last dialogue box. Try to add Trigger Once to the condition, so the event going to be triggered only once when the A key is pressed. So I added Trigger Once to condition and it worked for conversations with only 2 text boxes, but for conversations with 3 text boxes it skips the text box in the middle. Could you show a screenshot of the events you use? The problem is that, when you press the A key, the first event execute, increase the variable by 1 and then immediately after, the second event also execute because all condition is true for the first time and increase the variable by 1 again and immediately after execute the third event because the condition is true again, this is why it skip it. What you need to do, instead of using the Trigger Once, in this case would be better to create a switch to avoid multiple events execute the same time and make sure only 1 execute at the time. If scene variable Switch = 0 : Do all that and Do = 1 to scene variable Switch. This way only 1 event can execute any time the A key is pressed and only once. Is the player colliding with the computer? You move the player away. Try to check distance instead of collision. Also, move the event with the key release condition outside to make sure you reset the switch variable also if the player is not near a computer. EDIT:// I realize checking the distance is going to cause a bug since you disable the default controls on pressing ‘a’. 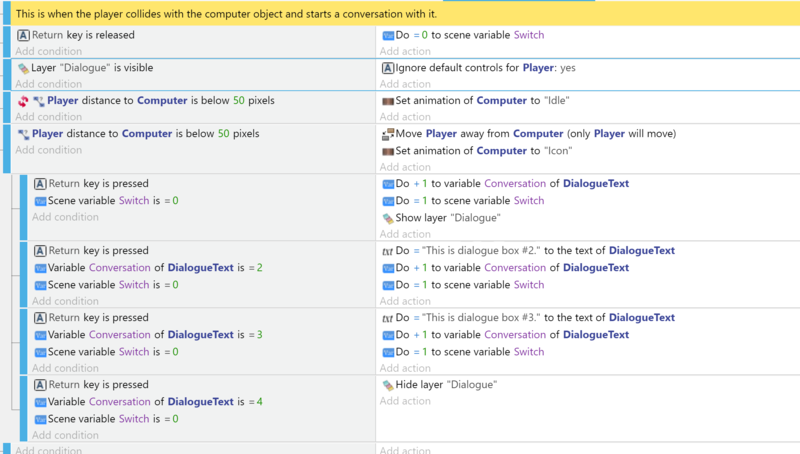 So you probably want to consider to use a different key either for dialog or player control instead of disabling controls on interaction with computer. It would be the most simple solution. 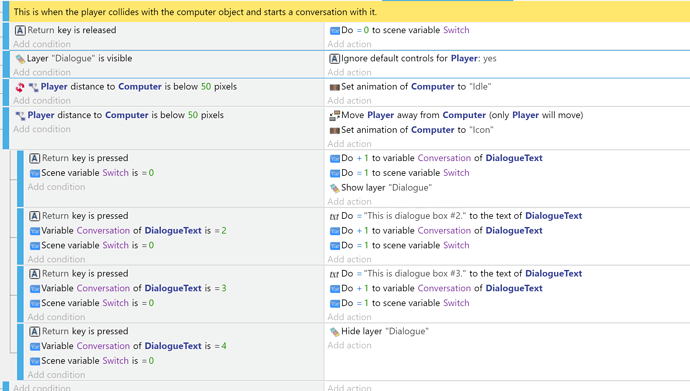 If you don’t want the player to be able to move while interacting, disable player controls while the dialog is shown and enable it once the player close the dialog. Put the dialog on a separated layer than you can simply check if dialog layer visible or not. If visible, disable controls, if not visible, enable it but use different controls for the two. Using either ‘E’ or ‘ENTER’ or ‘SPACE’ key for interaction is often used in games. Let’s remove all the useless stuff, ok? Sorry for bumping up this thread again. This question is related to RPG Dialogue as well, so I guess I’ll post it here. 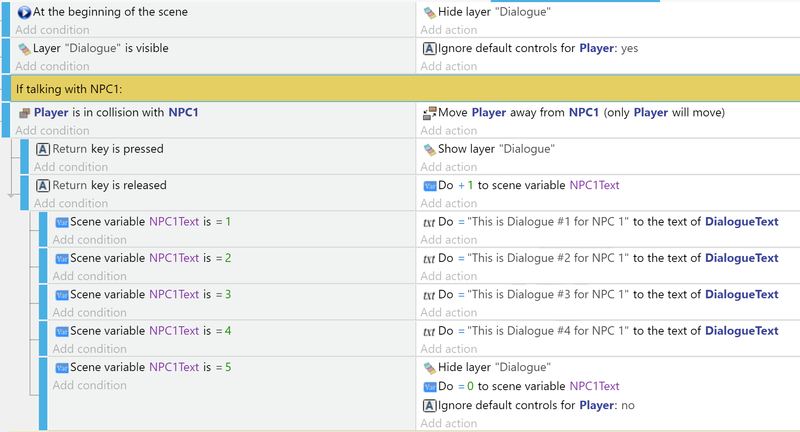 Thing is when talking to NPC1 again, the 4th text box quickly previews before going back to the 1st text box. Is there a way to remove this? The old text shows because you have separate actions for Return pressed and Return released.